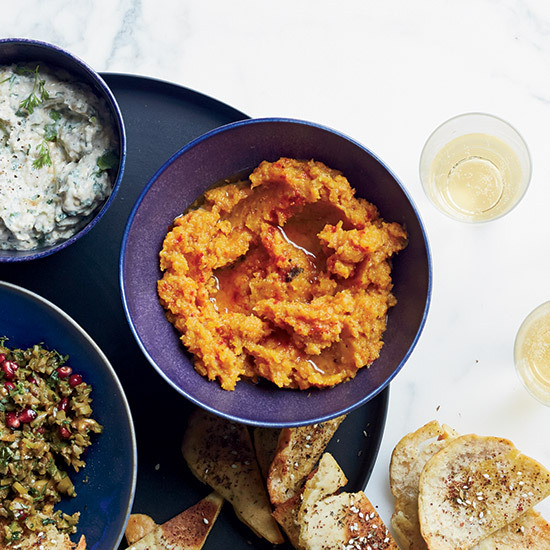 From smoky eggplant to sweet-spicy squash, here are nine terrific, portable dips for a Thanksgiving potluck. Smoky eggplant, fresh parsley and mint star in this healthy version of baba ghanoush. This warm, sweet-spicy dip is a great alternative to a cheese plate. Roasting everything together makes this vegetarian dip super easy. Bonus: It can be refrigerated for up to three days. Alex Stupak’s incredible Yucatán-style dip is great with tortilla chips or as a healthy vegan accompaniment for vegetables. This simple make-ahead dip is a fun take on the classic Waldorf salad. Ground coriander is an easy way to season this bright, tangy recipe. Hot curry powder, fresh jalapeño and lime juice give this healthful dip a terrific kick. This delicious, chunky dip is made with pomegranate in two forms: seeds and molasses. Ready in just 15 minutes, this fresh cheese spread is a specialty of Lyon, France.